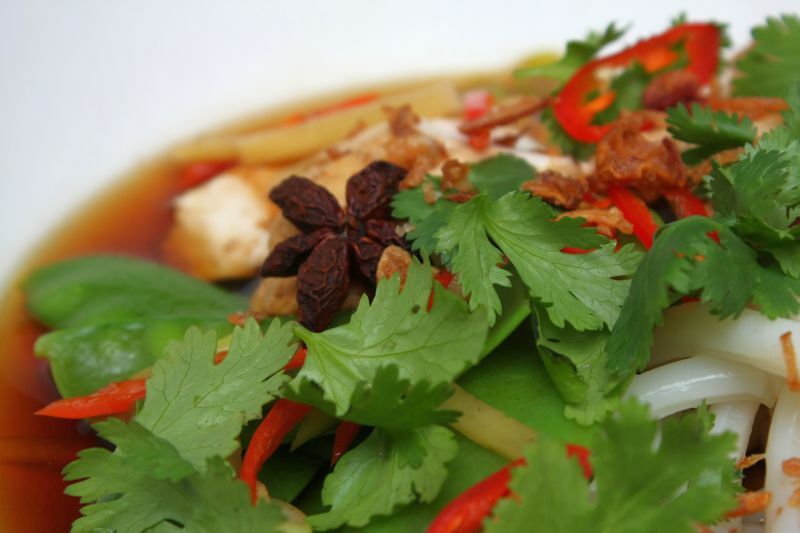 This dish is full of bright, clean flavours – chilli, ginger, and coriander – but it also has complexity and depth because of the subtle aniseed flavour and caramel overtones in the broth. 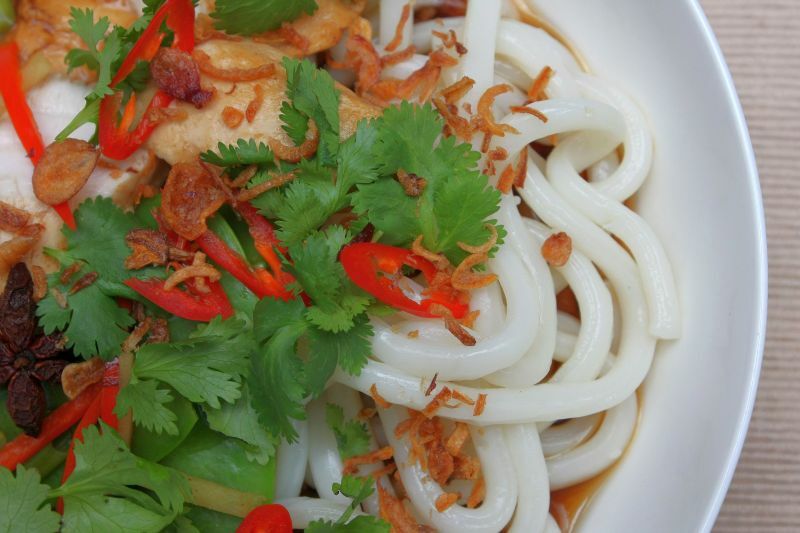 We love the textures and flavours at our place, especially the slurpability of the noodles, the crunchy fried shallots and the tenderness of the gently poached chicken. It’s so good for you it almost feels medicinal to eat this. On a rainy, miserable Sunday it certainly lifted our spirits. 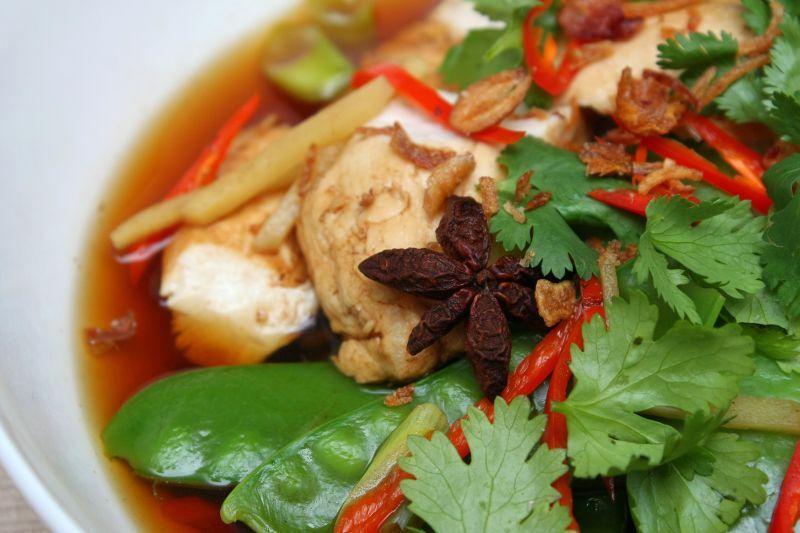 Bring the chicken stock, soy sauce, 1/2 the chilli, the ginger, shallots and star anise to a simmer in a large pan. The liquid should be about 3 cm deep. Place the chicken pieces in the pan and simmer gently for three minutes. Meanwhile, place the noodles in a mediun sized glass bowl and pour enough boiling water over the noodles to cover them. Let the noodles sit for 3 minutes in the water and then drain well. Turn the chicken pieces over and add the peas to the broth. Cook for another three minutes. 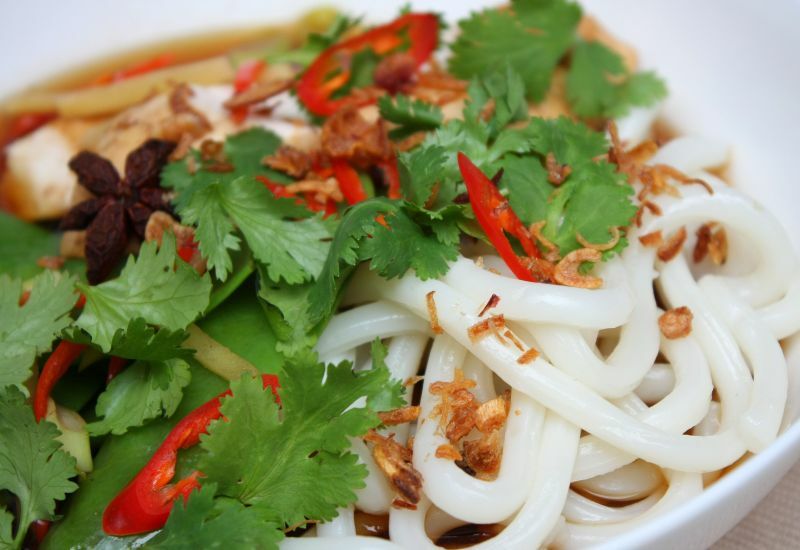 To serve, divide the noodles into 4 deep bowls, and then place the tenderloins on top of the noodles. If you like you can slice the chicken on an angle into pieces first. Carefully ladle the broth over the chicken and noodles, making sure everyone gets their just serve of peas and the yummy ginger, fresh shallots and chilli. Sprinkle over the fresh coriander, fried shallots and the remainder of the chilli and serve at once. I love fresh udon noodles and your bowl looks delicious. I love this sort of dish!